Is amazing how much work we will do in the coming weeks just so that we can have a few days off to relax and spend time with the family. Before you can enjoy your holidays, you need to get the home ready. And that means getting rid of winter rubbish. The fastest approach to that type of job is to bring in help from Junk King Dayton. What classifies as winter rubbish? Start with all the things that normally come out in the winter but that you no longer using. They could be all kinds of heavy coats, mittens, boots, hats, scarves, sweaters and other bulky clothing items that once kept you warm but now you’re in different to. Whether they’re just not your style or fit there’s no reason to hold onto clothing that you no longer going to wear. You might feel guilty about throwing all that stuff into the trash and you should. But it won’t end up in the trash if you hire Junk King Dayton. They’ll make sure that stuff gets dropped off at an area charity. That way it can be put to use by someone in need. It really is the best way to get rid of your old clothing. Of course, winter rubbish isn’t just things you find in your closet. They could be a lot of rubbish down the basement or out of the garage that you’d like to get rid of. Maybe you have a broken snowblower that’s taking up space in the shelf. You definitely need to get rid of that if it’s being replaced this Christmas. There could also be all kinds of winter sporting equipment that your kids have outgrown that you want to toss out. Does an old snow boot or snowboard really have a lot of sentimental value? 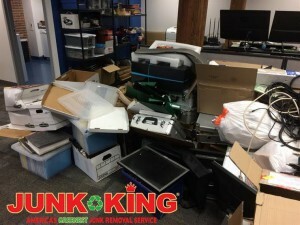 Working with Junk King Dayton really means you’re working with a pair of movers who have a lot of experience lifting all kinds of heavy and bulky objects. This is a crew that is 100% professional and always shows up with a positive attitude. If you want to get rid of your winter rubbish fast, then Junk King Dayton is the only way to go. This entry was posted in Dayton Junk Removal and tagged Junk King, Junk removal, rubbish on December 2, 2017 by Junk King. Last updated December 2, 2017 .